St George is bringing 'happy' to Diwali celebrations... in dragon form. 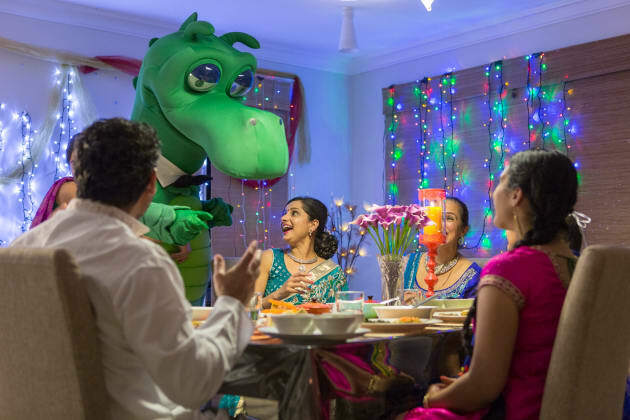 Happy the Dragon is back, and this time he's spreading the St George joy to Diwali celebrations. It's part of a campaign developed by Ogilvy's multicultural communications agency Etcom for the bank, which is targeting the Australian Indian community in the lead up to Diwali on 23 October. The campaign is led by social video and supported by Facebook, Twitter and YouTube activity, encouraging those celebrating Diwali to share photos via social media using the hashtag #StGeorgeDiwali for a chance to win flights for two to India. Speaking to AdNews last week, Etcom general manager Thang Ngo said that print and radio were typical channels that marketers used to reach a multicultural audience, but with the advent of social media, that trend is starting to change. He added that this campaign is the first 100% social campaign targeting Indian audiences in Australia. “But Diwali is about colour and emotion. It’s visual, interactive and exciting so we’ve deliberately selected video and used targeting capabilities in Facebook, Twitter and YouTube to serve our ‘Happy’ video to Indian-Australians," Ngo said.